A few of the mezcals we tasted in Buffalo. When you travel like I do, frequently your writings suffer. So does your time to just sit with friends, relax with some good mezcal and talk about life. Recently I was in Buffalo, New York. That gave me time to catch up with Ed Draves who helps us taste the many mezcals, tequilas and wines we come across in our travels across Mexico. I knew this night was coming when I got on the plane in Las Vegas so I made sure my bag was full of samples. When I arrived, Ed told me too he had pulled a few bottles from his collection as well. 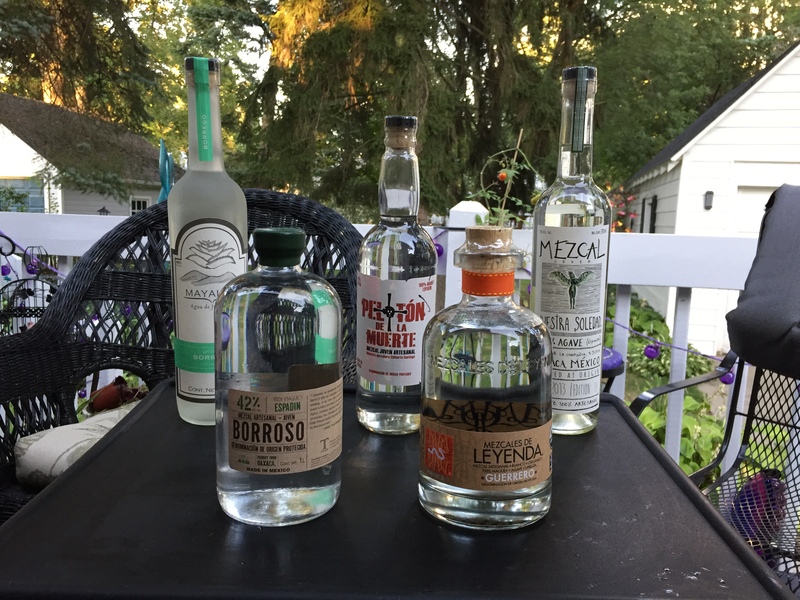 When we put it all together, we had seven widely available mezcals to share between us over a long evening under the stars on a warm night in Buffalo. Emperatriz NOM-0320X… This is an espadín with an ABV of 40.4%. This is a smooth mezcal, bright with huge red fruits on the nose. You’ll get a nice sweetness and a great mineral finish owing to it being from rockier soils near the isthmus of Oaxaca. Nuestra Soledad NOM-098X… An espadín coming in with an ABV of 47%. This mezcal, from Ejutla, Oaxaca has a rich mineral nose with a nice viscosity in the mouth. You’ll experience notes of cocoa that will give way to a very dry, minerally finish. Peletón de la Muerte NOM-0117X… Another espadín, this one from Maestro Mezcalero Cutberto Santiago. With an ABV of 41% this mezcal has a very clean nose of fresh linen, is very mild and light. Like a lot of the mezcals we sampled that night, this one too has a very nice minerality. This is a good mixing mezcal to have in your collection. Leyenda NOM-0117X… From Don Oscar Obregón, this mezcal is distilled from the agave cupreata. It has an ABV of 45%. This is an easy drinking, very light and pleasant Mezcal. It shows some petrol on the nose with a nice chalky (very dry) finish. Borroso NOM-O522X… From Oaxaca by way of Ensenada, this espadín has an ABV of 42%. This is smooth mezcal with a smokey nose and mint undertones that give way to smokey/sweet notes. It’s flavorful, not overpowering and has a nice, sweet finish. Aguas del Corazon… We sampled the arroqueño from Sola de Vega. Clay distilled and hand mashed with giant wooden mallets, this is the very definition of ancestral mezcal. Coming in at an ABV of 48.7%, we found tangerine on the nose with explosive flavors of mineral and orange zest. This mezcal has great acidity and a little heat on the finish. One of our favorites of the night. Mayalen Borrego NOM-G169R… This is a pechuga [lamb] mezcal made from the agave cupreata. This mezcal would be a perfect accompaniment to a smoked rack of lamb with mint jelly. You’ll taste anise, black licorice with a nose of a Christmas cookie. This complex mezcal is full of warm spices on the tongue that carry well onto the finish. This could be your holiday mezcal. It comes in at a 49% ABV. If we scaled these mezcals, Mayalen Borrego would rate 4.5 magueys and our “best in show” for the night.